Julie W. and Suzi S.
Please Note: The First Class beginning 09/10/18 will be 2×2 weaves. The Training to Trialing sequece listed below will begin on October 22, 2018! This class series focuses on all aspects of trailing including entering a trial, knowing how to walk a course, understanding what the judge expects, as well as strategies for navigating the show site, waiting to enter the ring, running the course, exiting the ring and celebrating with your dog. The course will help you and your dog wean off toys/treats, work with people, dogs and other distractions in or near the ring, and help you maintain a connection and focus under pressure Using games, drills, and challenges the dogs and handlers will develop good team habits, reinforce foundation skills and learn tips/tricks that can be used in throughout the dog’s agility career to reinforce excellence in the ring. The students will work toward and be encouraged to enter CABTC’s Jan. Feb and/or March trials. The series of three, 6-week classes that are designed for the Novice dog preparing to enter the ring, as well as a more seasoned dog encountering difficulties that may be limiting their success in the ring. 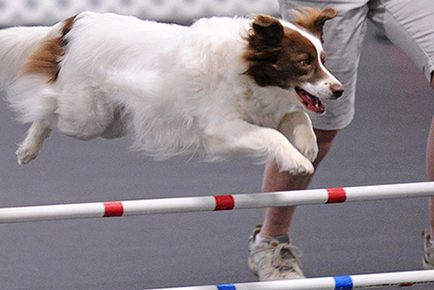 All dogs should be able to perform all obstacles, though dogs still learning an obstacle or two may enroll with instructors’ consent. Students are encouraged to take all three sessions, but may join at any time. Each session will build on the previous one and focus on different skills. Training to Trialing #101 – Objective is to review obstacle performance and to work toward independent performance of each obstacle. We will also review and refine basic handler cues (FC, BC, Post turns) and refine dogs understanding of the cue. We will also work on trial site skills such as crating and walking/waiting in more crowded conditions. Training to Trialing #102 – Begin the process of acclimating to the trial atmosphere by working short sequences with emphasis on start line stays, finishing line behaviors, and weaning off treats/toys being on the person. We will continue to work on trial site skills, including warming up, waiting in line, and entering/exiting the ring. Training to Trialing #103 – Learning to walk, learn the course and plan your run. We will run short courses under increasing pressure on both handlers and dogs to prepare with trial pressure and distractions. Note: On 3/25/19, 4/1/19 & 4/15/19 the class will consist of a “Mock Trial”. Training to Trialing #103 Obstacle Handler Focus will start on 4/15/2019.